Offering an exciting alternative to your ordinary New Year's Eve plans, bid farewell to the end of the year and welcome 2015 in with a bang at NYE Croatia. Featuring two massive parties at night and plenty of sightseeing and leisure during the day, Zagreb will come alive with electronic beats. With renowned headliners such as Thomas Gold and Mark Knight, NYE Croatia promised you the ultimate opportunity to welcome in 2015 in style! We are giving one lucky winner (and 2 mates) the chance to win the ultimate NYE holiday! 1. Flights will be from London Gatwick Airport. The prize does not include transport to and from airports. 2. Entrants must be aged 18 or over at time of entry. 3. Applicants can only Enter once. 6. The winner will be contacted on Monday 8th December and must reply within 48 hours to claim prize. 8. If you do not claim your prize within 48 hours of being contacted, Festicket reserves the right to select another winner. 10. 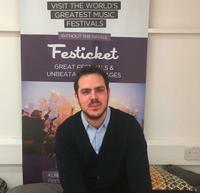 Festicket reserves the right to amend the prize as necessary. 11. The prize cannot be exchanged for cash or credit.